We are so ready for spring. Winters are often very challenging on the farm, and this year we were short volunteer help which made it that much more difficult to get everything done. We are so grateful to all the people that came out to help us in the freezing cold to care for the horses ­­-- thank you. Many hands really lessen the load. The horses are ready for spring, too, and to have their winter blankets off. They are itchy from shedding their winter coats and look forward to feeling the warmth of the sun on their backs. We were recently blessed with a generous donation to the Equine Relief Fund. This will bolster the fund and allow us to help more horses in need off the farm. We really look forward to being able to make an often life-saving difference again this year for such horses..
As much as we would like to, we do not foresee taking in any new rescue cases at this time. We simply don’t have the help, and with over 30 aging horses, there is a lot of care involved on a day-to-day basis. 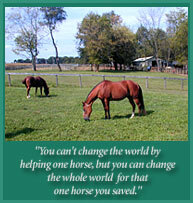 To this end, we are in need of additional volunteers to care for the horses as well as in several areas of our rescue. If you are interested, or know someone who is, please read more on page 6 or visit the Volunteer section of our site. We regret to report that the rescue did not finish up 2018 as well as we had hoped. We lost an approximate $15,000-$20,000 in donations that typically have come in in past years. 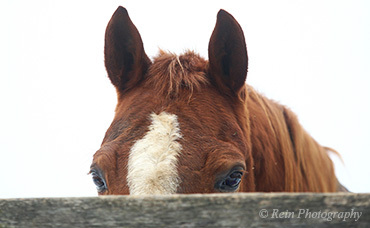 This is a big hit for us, and why we really need to do well for Help a Horse Day! With the opportunity of people’s donations being matched up to $10,000, thanks to one of our very generous donors, we could raise some much-needed funds for the horses. Please read all about Help A Horse Day, and be part of this exciting matching opportunity -- the horses need you! Thanks to everyone who helps with our wonderful horses.